The above haiku/senryu is inspired by photo-haiku challenge by Susi Bocks in her blog, I WRITE HER. 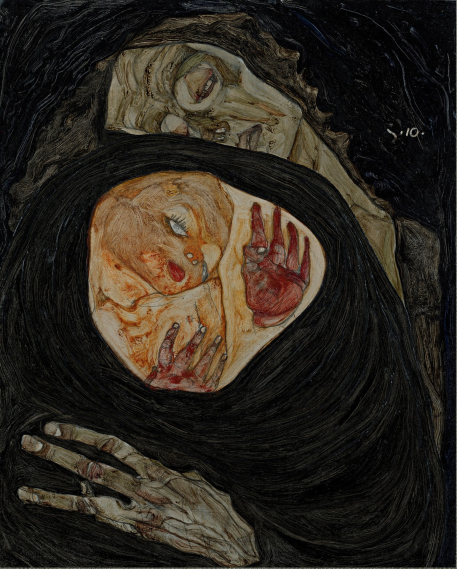 She has just informed me that the original painting was by Egon Schiele, an Austrian, died at an early age of 28 years. His Expreessionism ,with twisted shapes and dark lines, had gained both praise and blame. The striking visual is a Newborn for haiku/senryu writers in an age of dark dying genre; impregnated by love and warmth to provide poetry an upside down perspective. This entry was posted in life, poetry and tagged Expressionism in haiku, in search of inspiration, love poetry of Dr.Lim Keng Huat, poetry translation, poets interact, visual haiku with new twist on February 2, 2019 by wonkywizard.